The European Commission and the Ministry of Economy of the former Yugoslav Republic of Macedonia organised the COSME Workshop and Access to Finance Day on 10 to 11 November 2015 in Skopje. The aim of the workshop was to present COSME - the EU programme to promote the competitiveness and sustainability of small and medium-sized enterprises (SMEs) - to prospective beneficiaries giving an overview of its objectives and main actions. The Access to Finance Day provided the opportunity for key SME finance stakeholders and financial intermediaries to discuss the design of future instruments for the new programming period 2014 to 2020 under current EU programmes. These include the Western Balkans Enterprise Development & Innovation Facility (WB EDIF), Horizon 2020 and COSME. 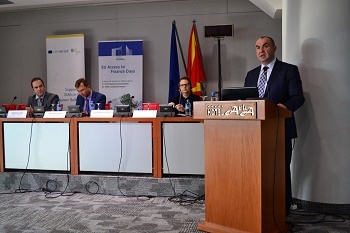 Workshops were opened by Deputy Prime Minister in charge of Economic Affairs, Vladimir Peshevski; Minister of Economy, Bekim Neziri; and Head of Cooperation of the EU Delegation to the former Yugoslav Republic of Macedonia, Martin Klaucke. Speakers included representatives from the European Commission, European Investment Fund, European Bank for Reconstruction & Development and South Central Ventures as well as EU country experts in the field. More than 100 participants attended the event, including business support organisations, associations of entrepreneurs, national, regional and local organisations and institutions, financial institutions and intermediaries and representatives from the Ministry of Economy and the Ministry of Education and Finance. COSME is the EU programme that aims to strengthen the competitiveness and sustainability of SMEs. It is running from 2014 to 2020 with a budget of €2.3bn. COSME supports projects on a wide range of business environment topics, such as clustering, female entrepreneurship, reducing the administrative burden on companies, tourism projects, and intellectual property rights protection for companies operating in third countries. COSME will stimulate the flow of credit to SMEs and, in conjunction with other EU programmes, will help to bridge market gaps in the provision of SME financing and restore the competitiveness of Europe's economy.